Whether you’re looking for a classic, timeless capturing of your special day or a less intrusive photo-journalistic recording, or a combination of both styles, you’ll get what you want when we photograph your wedding. Regardless of whether you’re having a traditional or non-traditional celebration, just the two of you or everyone you know, you can rest assured the images we create will be memories cherished for a lifetime. Click the image to see an example of what we sent the client to choose from. 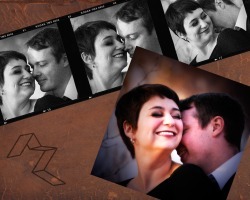 An engagement session with us will allow you to capture a timeless moment that can be shared at your wedding. Want to do something crazy in your dress? For most brides, after the wedding the dress goes in the closet. Our "Enjoy the Dress" sessions capture you having fun, doing whatever you want, in your dress. Whether your hobby is rock climbing or snowboarding, golfing o just lounging, these sessions allow your personality to come through first and foremost. Many in the wedding industry refer to this as "trashing the dress." We like to think of it as an event inspired with a bit more love. You can read an article about this kind of session here.